The US brand just launched a new A4 colour MFP named WorkCentre 6400. This new machine is the fastest in A4 Xerox range : 35 ppm in B&W and 30 ppm in colour. The WorkCentre 6400 offers characteristics usually found on A3 devices : for example the functionnality "Print around". This allows to promote a job without any human manipulations : when an user asks for a specific paper which is not in the MFP, the machine doesn't stop and start the next job. 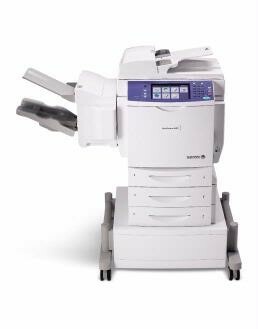 Duplex copying and duplex printing come in standard on the WC6400 . Extensible Interface Platform (EIP) from Xerox which allows to integrate some specific softwares, is as well available on this MFP.